I wanted to make a new costume for this year to compete in local contests. I wanted something original and from my own head. Once I found the mask I wanted, I started designing the costume around it. 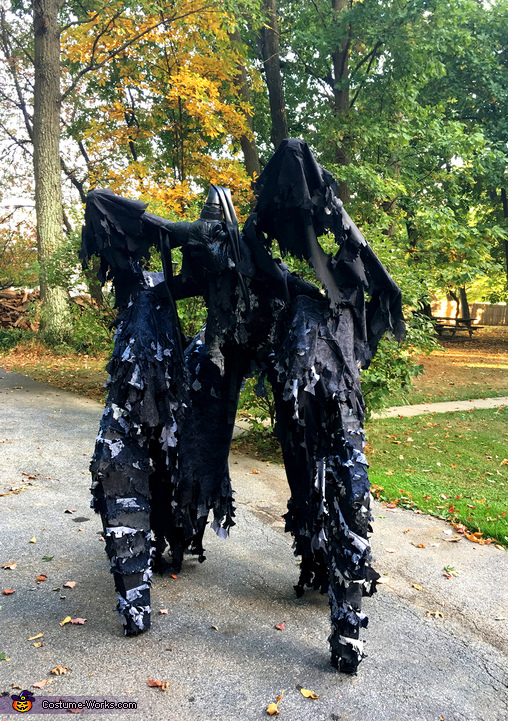 The entire costume is on stilts and includes fully motorized wings to create about a 12' wingspan. The front legs are made using modified arm crutches and the back legs are my own pair of stilts. The chest is a modified zombie gut costume piece from Party City. The whole costume is a mix of PVC pipe, wood, insulation foam board, hotglue, zipties and a range of different fabrics from Joanns. The costume has been an absolute hit so far and hopefully gets me a couple contest wins this year. Thanks for checking it out and hope you like!